Happy Friday, blog friends! Today is the Sweet 2 Repeat Blog Hop at SugarPea Designs, where we share more inspiration using the most recent Fall release! I will have all the giveaway and blog hop info at the bottom of the post, but how about we get to my card first? 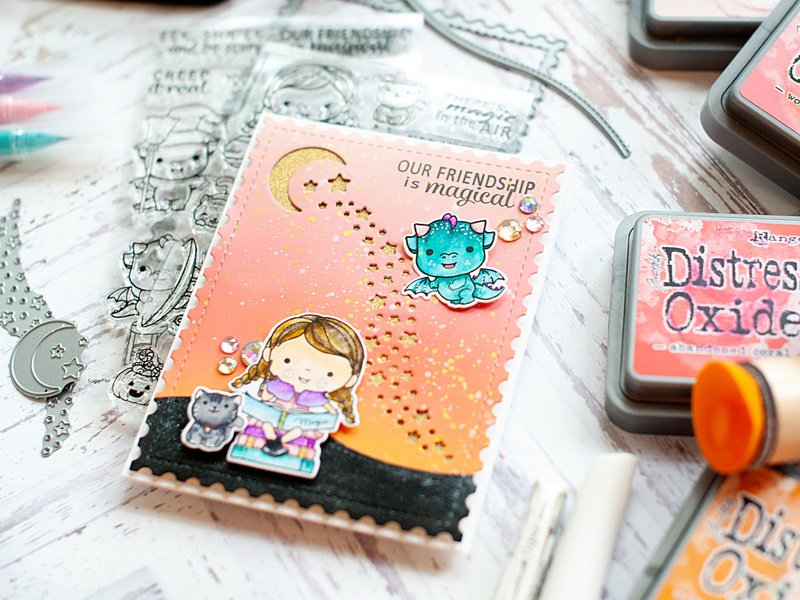 I have used a combination of products from SugarPea Designs today, including Bewitched, Darling Dragons, Hocus Pocus SugarCuts & Stardust SugarCut. 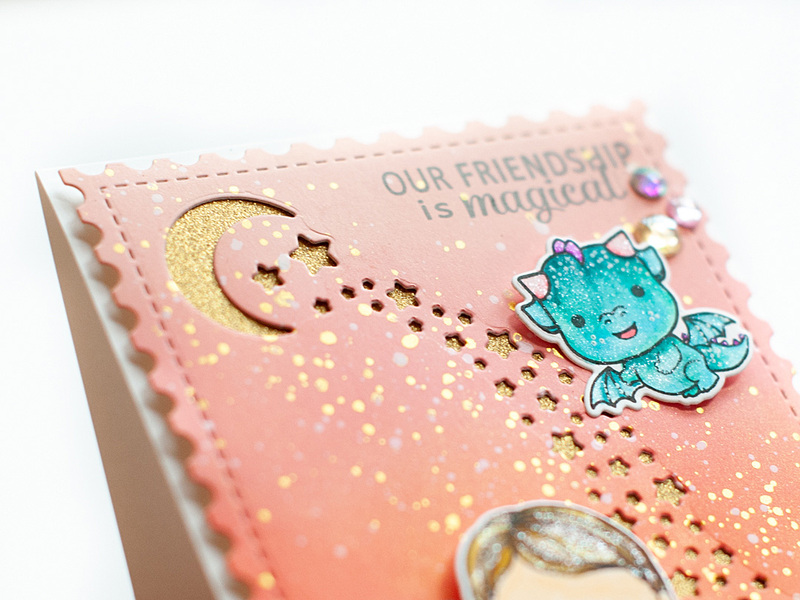 During the release I only used a couple of small items from the Darling Dragons stamp set, and I wanted to be sure to stamp & color one of those cutie dragons this time around! To start I ink blended a sunset to a white cardstock block using Distress Oxide inks in the following colors: Tattered Rose, Worn Lipstick, Abandoned Coral & Spiced Marmalade. Then I splattered white & gold paint to the front of it, and set aside to dry. Next I stamped the girl, dragon & kitty to white cardstock in onyx black Versafine. I colored them in using my Zig Clean Color Real Brush markers, then diecut them with their coordinating dies. Then I diecut a block of black cardstock with the Card Front Element Builder, and adhered it to the bottom of the ink blended panel. Then I cut the entire ink blended panel using the Postage Stamps coverplate. And finally I diecut the stardust plus moon & stars from the middle of it. I mounted the ink blended panel to gold glitter paper, then stamped the sentiment directly to it in the upper right corner. Then I mounted the entire panel to a top folding white A2 card base using foam adhesive. Then I adhered the colored cuties to the front using foam dots. The final touches were coloring them in with my Tonic Aqua Shimmer pen, and accenting with jewels here & there. As I mentioned, this is a blog hop! Would you like to WIN a $20 gift certificate to spend on some SugarPea Designs of your own? Please visit each of the design team members listed below and leave a comment for your chance to win! The winner will be announced on Saturday, September 29th on the SugarPea Designs blog. Have a wonderful rest of your Friday, and Happy Hopping! I love how you coloured your card! Very cute stamps! That dragon!😍😍😍 such a sweet design! Oh. my goodness! I love your card today~! I like the sparkly moon and stars for the background of your cute, magical scene. Your background is amazing! I love the glitter moon and stars! I love your card. 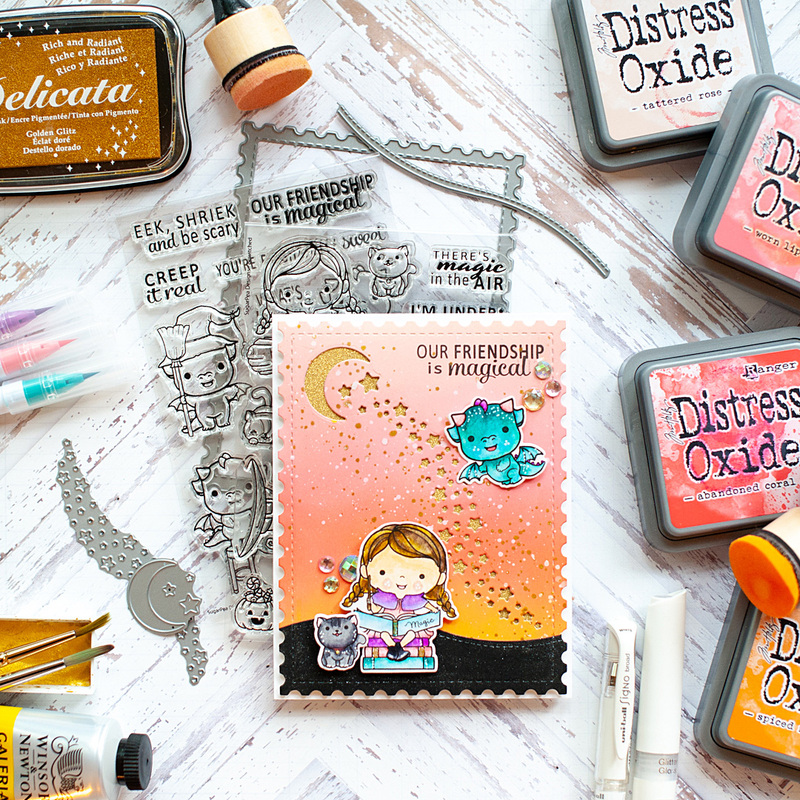 The star die and that postage stamp die are so cute. Sweet card. Love the trail of stars. Cutest card! I love the sweet stars, the colors, the scalloped edge, everything! OK now this has got to be one of the most amazing, beautiful, and cutest cards ever! I am so loving all the die cut patterns and the colors and your coloring and the gold glitter behind the background! There are so many wonderful things about this card! 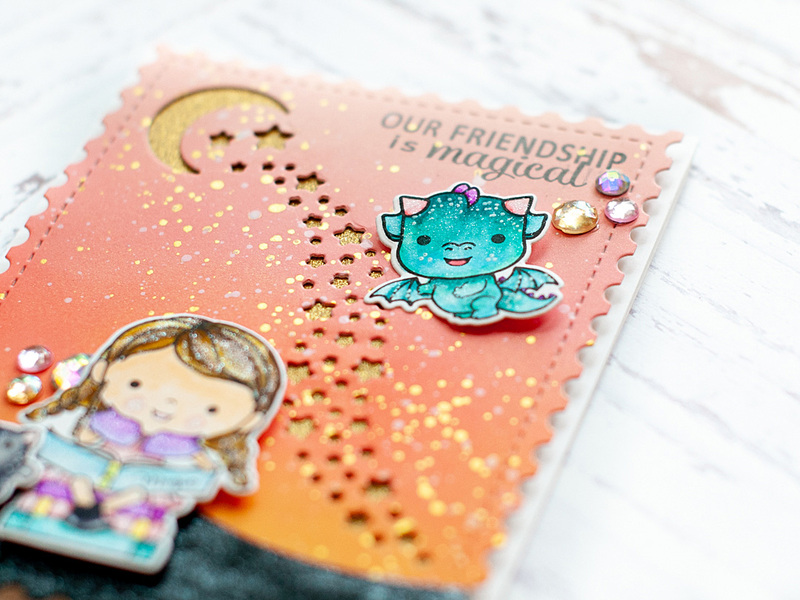 I love the inked background, the stars and the gold paper underneath the stars, the cute dragon and little girl. Thanks for the inspiration. Your card is adorable and magical! So pretty! I like the sparkles and the colors! Love this sweet card. The colors are beautiful. Magical, marvellous way you have blended then coloured with zigs, gorgeously cute card. I don't have Instagram but I do stalk your blog & you tube already. Darling card! Lve that stardust and your beautiful coloring! Hi! Great card and I am over the moon on the star and crescent 🌙 moon cutout in the middle of your card. That element is fantastic! I am not on the Instagram, but I will look forward to subscribing to you You Tube channel! Beautiful background ...love the colours and the stars along with the adorable images. Awwww . . . how sweet! That background is fabulous and I love the star cutouts! Ack! This is sooo cute!